Children's Books are some of the most powerful tools in the world. Use them. ​Clive and Ian, like many brothers, enjoy camping out under the stars. On a clear summer night, the stars above are beautiful, leading Clive and Ian into a discussion about who created the night and the day and how he did it. Clive and Ian are an amazing couple of brothers who enjoy talking about God and all that he has done for us and our lives. In this book, Clive and Ian discuss how God made the Earth. Then he made the sun to shine during the day and the moon and stars to bring light to the darkness of night. The illustrations in this book are beautifully done. I really liked how the creation of light was depicted. The writing is clear and easily read without an overtly intricate vocabulary that would be difficult for young readers. They begin by discussing how God created the earth and that he really wanted to make day and night. I would recommend this book to Christian families and young readers everywhere. I would give this book five out of five stars. I received my copy of this book from the publishers at Jellytelly Press for the sole purpose of providing an honest review and the image featured above is my own. ​When Clive and Ian spend a summer day at the zoo, Ian can't wait to see the tiger's polka dots, but tigers don't have polka dots. They have stripes because that's how God made them. Join Clive and Ian on their trip to the zoo and discuss with them all the many different animals God made. Clive and Ian are out learning about the world that God created for us. Today they are learning about animals. Not just the animals at the zoo; they talk about everything from the stripes of the tigers to the bouncy bunnies. The writing in this book takes on the form of a continuous dialogue between these two brothers. The vocabulary remains reasonable for the age group of the audience. The illustrations are bright and each and every animal is easily recognizable, even the tiger with the polka dots. Clive and Ian appear to be having a fun visit. The artist’s use of bright, cheery colors conveys some of Clive and Ian’s enjoyment. I enjoyed how the author compared unusual animals. For instance, if an author were to compare a large elephant to a smaller character, in my experience, the most commonly used animal is the mouse. Ms. Hall, however, compliments an elephant with a ladybug. I thought this was interesting. I enjoyed this book as much as the other two I read and reviewed. I think this is a great book for families with young children and that is who I would recommend it to. I would give this book five out of five stars. I received my copy of this book from the publishers at Jellytely Press for the sole purpose of providing an honest review and the image featured above is my own. ​We have all marveled at the beauty of the world around us. When brothers Clive and Ian go out on a picnic one day, they discuss all the wonderful, beautiful things God has made. Join Clive and Ian on their picnic and be reminded of all the wonders God has made. This book is a cute way for children to better understand what exactly the Bible meant when it said that God created the world. It’s also helpful to get young inquisitive minds interested in nature and the way the world works. The illustrations are good, utilizing bright colors to simulate a summer’s day. The inclusion of the flowers, butterflies, and birds provide the scene with an overall peaceful feel. On the pages where Clive discusses the presence of nothing, the illustrations are dark, however, not so dark that it would be scary to the younger audience and both Clive and Ian are clearly visible. The writing is thought-provoking while still being informative. I thought this book was well written and constructed and would give it five out of five stars. I would recommend it to Christian families with young children. I received my copy of this book from the publishers at Jellytelly Press for the sole purpose of providing an honest review and the image above is my own. ​God created each one of his children to be special and incredible in their own way, and we all have an important job here on earth. When it is raining one afternoon, Clive and Ian must find ways to entertain themselves inside. Ian dawns a cape and proclaims himself ‘Ian the Incredible,' but what makes Ian incredible? This is a cute little book, perfect for young readers just learning to read and any child who wonders whether or not he or she really is incredible. The illustrations are simple and filled with bright, eye-catching colors. The background details are simple enough that they don't distract from the actions of Clive and Ian. Clive and Ian themselves look similar to their puppet counterparts; they even maintain a certain fuzzy look to them. The writing itself is fun and upbeat. After Ian proclaims he is ‘Ian the Incredible' Clive asks him numerous funny questions before helping Ian to recognize what really makes him incredible. At the very end of the book, there are suggested activities and questions for parent and child to tackle together to help them to connect more to the story. I would definitely give this book five out of five stars and would recommend it to families with young children. I received my copy of this book from the publishers for the sole purpose of providing an honest review and the picture featured above is my own. ​Kia and her team from New York, the Crimson Five, made it through Nationals. Now they are on their way to the Piedmont Global Championships in Quebec. There they will compete against other kids just like them, inventors and problem solvers from around the world. But when they arrive, the team is presented with a new task that they must solve, and in only two weeks. When lack of inspiration and nasty rumors leave the team with doubts. Kia knows that they will have to do something to bring them all back together before it is too late or they will lose the competition. This was a very entertaining story about a group pf five very creative and intelligent young people as they compete for the chance to have their invention created. Kia is the main character of this story, but in reality it follows all five of her team members. These kids are very bright for their age, but they are still young children so they have doubts, and worries and fears. I loved the ideas and the inventions the Crimson Five and the other teams came up with. I wish I had read book one beforehand in order to know more about their first invention, but despite that fact, I was still able to follow along. The settings were very imaginative and intriguing. Their tree-houses were very creative, as well as the thinking pool. Though I wish I had been able to know how to get across those jungle gym bars. All in all, I really enjoyed this book and would give it four out of five stars. I would recommend it to young readers with a love for invention. I received my copy of this novel from Librarything.com for the sole purpose of providing an honest review. The image featured above is my own. ​We all know the traditional nighttime prayers for small children. Also the prayers we say right before we eat. But we don’t have to be eating or sleeping to be able to pray. These baby animals and their families will help children to learn to pray for all kinds of situations and any time of day or night. I found this to be a very cute little book of prayers. The illustrations are beautiful, with soft textures and soothing colors. Each new page shows a different set of animals, presumably a child with one of their parents, though not all of the pages are this way. One simply has two young squirrels and the corresponding prayer in about a sibling. The prayers are simple and for the most part. Flows well. There are a couple that might be a little more difficult to for the new reader. The prayers cover a wide variety of times and situations throughout the day that one might pray. Everything from waking up to not sharing your toys to sick loved ones to bedtime. My children and I really enjoyed this cute little book of prayers. My children also loved the animal illustrations. I especially liked the Bible verses attached to each prayer. I would give this book four out of five stars and would recommend it to young readers who enjoy similar books. I received my copy of this book through Booklookbloggers.com for the sole purpose of providing an honest review and through them I have permission to use the image above. Scarboy and his brother, Little Child, have just lost their mother. With no father or mother to care for them, they become wards of the evil Enchanter and the Enchanted City. Scarboy’s mother used to tell him stories of an exiled king. When presented the opportunity, Scarboy and Little Child take the chance to go and find the king their mother told them about. This is a very interesting allegorical story. I am surprised I have never heard of it before. I thought this book might be another good one to read to my kids, but they didn’t particularly like it or understand all of the connections. I believe now that they may be too young for it. The illustrations are very detailed. Filled with the colors that reflect the situations of the world. The people are full of life and the illustrations bring that forth, including the darker parts. I would have to give this book 2.5 out of 5 stars and would recommend it to anyone who enjoyed the Chronicles of Narnia novels. I received my copy of this book from BookCrash.com for the sole purpose of providing an honest review. To hang with awesome Dino dudes. Every parent wants their child to eat healthy, but that can be a challenge. Now kids can enjoy this adorable story about a rowdy group of dinosaurs getting together for a healthy and fun picnic dinner. I found this book to be very cute in its simplicity. For the most part, this is a whimsical story about a bunch of dinosaurs simply getting together to have dinner. They discuss eating their vegetables as well as their meats and how doing so will help you grow big and strong. They gather up all of the foods they plan to eat, prepare them together, say a prayer, and have dinner, without burping. It is very quick and to the point, which is perfect for the age group as they tend to have a shorter attention span. My children seemed to like the illustrations and I found them to be cute, with bright colors and friendly, playful dinosaurs, even the t-Rex. In the long run, I am not under the impression that it will have a huge effect on a picky eater who is trying to get away without eating their veggies, but you never know. It might just help. Especially if they child is a super big fan of dinosaurs. I found the whole book to be a great read for you and your small child, or grandchild to enjoy together. I would give this book five out of five stars and would recommend it for young children, especially those who enjoy dinosaurs. I received my copy of this book from BookLookBloggers.com for the sole purpose of providing an honest review. Through them I have been granted permission to use the image of the cover artwork featured above. From JIGSAW JONES: THE CASE FROM OUTERSPACE © 2017 by James Preller. Reprinted by permission of Feiwel & Friends. All Rights Reserved. ​Jigsaw Jones, private detective, has a new case. When Joey and Danika, Jigsaw’s classmates, discover a mysterious note tucked into a book from the new little free library, all evidence leads them to believe there is a visitor coming … from outer space. Can Jigsaw Jones and his partner, Mila Yen, solve The Case from Outer Space? Jigsaw Jones is a third grade private investigator. If you have a mystery that needs solving, a puzzle that needs puzzling, he’s the kid for the job. This was a very interesting and cute children’s novel, perfect for inspiring young readers. Jigsaw is a very funny and intelligent young man, with an intense love of puzzles. His friends are equally entertaining, especially Joey, who has an insatiable appetite. I found the mystery to be very entertaining and Jigsaw’s investigation skills and simplicity, suitable for such a young sleuth. I would give this book four out of five stars and would recommend it to young children who like a good mystery. I won my copy of this novel from Goodreads Firstreads and have received permission from Feiwel and Friends to use an image of the cover artwork above. The stories of the Bible all teach valuable lessons and morals that we should apply to our daily life. As a young child, however, it can sometimes be difficult to know what those lessons are or how one can apply them to your daily life. 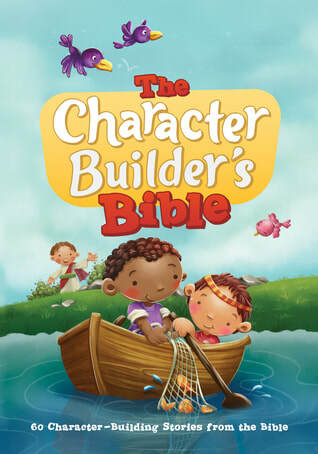 With “The Character Builder’s Bible” your child will learn the stories of the Bible and what lessons those stories teach along with suggestions for applying them to your daily life. I found this to be a very useful way to help my children understand what God wants them to learn. First we read a Bible story in a way that made it easy for my children to understand. Then we broke down the meaning of the story, the lesson buried inside. Besides the suggestions, my children also enjoyed coming up with their own ways to apply the lessons. The illustrations are simple and beautiful with bright, vibrant colors and engaging character depictions. The Bible stories have been simplified to be more easily understood by young children. Though they have been simplified, they appeared to be very similar to other children’s Bible story collections. The summarizations of the lessons intended to be learned in every story are well thought out, rationalized, and explained. The manner in which they are written helps to present them in an easy to understand light for young readers. All in all, I found this to be a wonderful way to communicate these lessons to young children. I would recommend this book to families with young children. A great one to read together. I received my copy of this book from Tyndale Kids through their blogger program for the sole purpose of providing an honest review and have permission to use an image of the cover artwork above. Children's books are very important. As our children are growing and learning, books help to guide them on their journey.